Things are constantly changing in the social media world. It can be hard to keep up with all of the latest features and policy changes, so we’ve made it easy for you to stay up to date by creating a monthly roundup of what’s new on Facebook, LinkedIn, Instagram, and Twitter. This month, Facebook continued to make Groups a more attractive feature on its platform, while Instagram made it easier than ever to apply for verification. LinkedIn also tweaked some visual aspects of users’ profile pages, and Twitter implemented some changes that will affect the way you can use the platform in conjunction with other apps. 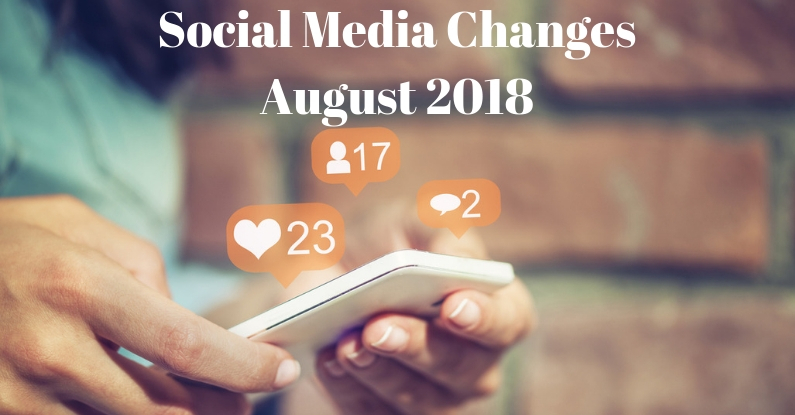 Read on for more of the noteworthy social media changes in August 2018. Have you ever dreamed of having a virtual mentor or mentee? Well, now thanks to Facebook, you can! One of Facebook’s more notable new features this month is a new mentorship program in Facebook Groups, where people who are in parenting, professional, or personal development groups can be paired up with a mentor or mentee by their group administrator. Once paired up, the matches can get to know each other through Facebook’s program, which will take them through guided mentorship steps and encourage them to check in with each other weekly. Facebook has made it easier for group administrators to optimize and analyze their groups by allowing them to use Facebook Pixels. For those of you who aren’t familiar with the Facebook Pixel, it’s a code that you can place on your website in order to track how your Facebook Page, or now Group, is driving traffic to your website and what users are doing once they’re there. Insights for this feature are available in the Group Insights page for groups who have over 50 members. As Facebook continues to tighten up their advertising and transparency policies, they’ve also made changes to the way advertisements can be targeted on their platform. This past month, Facebook removed over 5,000 targeting options for advertisers, including the ability to exclude specific audiences based on attributes such as ethnicity or religion. This was done in an effort to reduce discriminatory advertising. From now on, advertisers in the U.S. will have to complete an educational certification to show that they understand Facebook’s non-discrimination policy in order to continue advertising on this platform. This certification requirement will expand to other countries in the near future. If you’ve ever had the yearning to leave someone a voicemail on LinkedIn, well, your wish has been granted. LinkedIn now lets you send voice messages up to one minute long to your 1st-degree connections through LinkedIn Messaging. ou can now group multiple positions at one company in a single section in the experience portion of your LinkedIn profile, resulting in a cleaner, streamlined look. This month, LinkedIn adjusted its job search functions, adding the ability to select “remote jobs” as your location preference. As well, you can now indicate in your career preferences that you’re open to working remotely. For all of you who are vying after that coveted blue checkmark next to your Instagram username, good news—you can now apply for verification directly through Instagram’s mobile app. This can be done by choosing ‘Request Verification,’ in the settings section. However, just because it’s easier to apply, that doesn’t mean it’s easier to get approved. According to Instagram, to be verified, you have to be a notable person, brand, or entity, with a complete profile that is authentic and unique. If you didn’t already have enough to look at on Instagram, the platform is testing recommended posts to appear at the end of your Feed. When you see the “Recommended For You” message on your Feed, you’ll have the option to view your past posts or keep scrolling for your recommendations. Twitter’s API changes came into effect in August, limiting what you can do on third-party apps like Hootsuite or TweetDeck. As a result, notifications about mentions and direct messages may be delayed, and you can no longer see your timeline in real-time, but will have to manually refresh it instead. Facebook also changed their API this month, meaning you can no longer cross-post your tweets and retweets automatically from Twitter to Facebook. As for what new features we can expect in the future from Twitter, one possibility is an unfollow list. For a few days in August, Twitter tested a new feature that recommended users for you to unfollow, in an attempt to make users’ timelines more relevant to their interests. Twitter is also branching out into the world of TV, announcing this month that they’ve teamed up with Buzzfeed to produce a Twitter-based show called “#What2Watch,” which will review all of the latest TV content. The show will be made in Britain and have weekly 40-minute episodes launching later this year. As a TV junkie myself, I’m not going to lie, I’m interested. Check back next month to catch up on more social media updates. In the meantime, you can find our full social media changes report for August 2018 on AdviserU.